“Russian or English?” Chamitoff joked. All three countries are represented aboard the orbiting shuttle-station complex right now: six Americans, two Russians and one Italian. Fincke and Andrew Feustel quickly jumped into their 220-mile-high (350-kilometer-high) work, coming just three days after they conducted the second spacewalk of space shuttle Endeavour’s final voyage. “Wow, it’s great to be back outside. We have the most beautiful planet in the universe,” Fincke radioed as he floated out. “Nice view, isn’t it?” agreed Feustel. 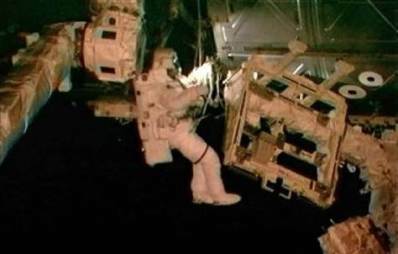 The spacewalkers hoped to squeeze in a task that fell by the wayside during spacewalk No. 1 last Friday. That excursion was cut short because of a carbon dioxide sensor malfunction in an astronaut’s spacesuit. This is NASA’s next-to-last space shuttle flight. One more spacewalk is planned, then Endeavour will undock from the space station and head home. Landing is set for June 1. NASA will close out the 30-year shuttle program in July with one last flight by Atlantis.